There was a major article published recently that looked at the lead content of many forms of calcium, both natural and synthetic. The study found that many types of calcium had measurable amounts of lead in them. 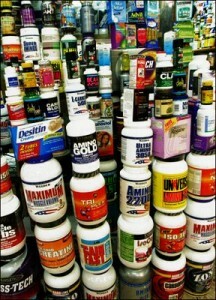 As consumers, you have many options when buying over-the-counter supplements. There are some types of calcium that have higher amounts of lead and traces of other metals in them. Certain natural forms, such as dolomite and bone meal, may have high levels of lead, whereas calcium carbonate, a popular type of calcium used by many healthcare professionals, was found to have minute, almost undetectable concentrations of lead. You need to be aware of what exactly you are purchasing, as it likely won't be on the label. The website www.consumerlab,com can help you navigate through different varieties. Omega-3 fatty acids are not made by the body so therefore, they need to be obtained from dietary sources or supplements. A common form of supplementation is in fish oil. Omega-3 has been shown to have anti-inflammatory properties that can help many medical conditions, including heart disease and diabetes. There is also a role for omega3 in the treatment of high cholesterol, particularly if high triglycerides are present. With regards to kidney disease, the results have not been as encouraging. Studies looked at the role of omega-3 fatty acids in the treatment of IgA nephropathy, a type of nephritis. While high doses did not lower proteinuria, they did reduce oxidative stress. In other studies concerning other types of nephritis, it showed a possible effect on decreasing protein levels in the urine. We are just beginning to learn about how inflammation affects the kidneys. There are likely several mechanisms that contribute to the level of inflammation in kidney disease, as spoken earlier. With our Western diet, many of us do not consume enough omega-3. Supplementation of omega-3 and polyunsaturated fatty acids may not only reduce the inflammatory response in the kidneys and help prevent worsening of kidney function; it may also reduce the risk of coronary heart disease in those with CKD. The optimal dose of omega-3 supplementation is not known, but it may be higher doses than have been previously studied. Omega-3 fatty acids are really the combination of two fatty acids called eicosapentaenoic acid (EPA) and docosahexaenoic acid (DPA). The ratio of EPA to DPA in a formulation may be important, as it is suggested that different ratios of these two in different formulations may give a different anti-inflammatory effect. There is an FDA approved omega-3 medication called Lovaza for the treatment of high triglycerides. There are other forms that you can buy, as well, but no matter which you choose, it is important that it is mercury free. Many will come in doses of either 1000 mg or 1200 mg. Normal dosage is two to three tablets a day, but can be higher depending on the inflammatory condition and triglyceride levels. Talk with your doctor before starting supplementation if you are taking any type of blood thinner. Spirulina is an algae that likely has protective effects on the kidneys. It has a tremendous effect on lowering cholesterol and triglyceride levels, as it did in one study that looked at people with nephrotic syndrome. It may also help in lowering blood pressure. There is no standard dosage for this supplement. Based on some studies, the usual dosage has been 500 to 1000 mg a day. It can interact with a number of blood pressure medications and diabetes medications, however, so consult with your doctor before taking it. Vitamins and natural supplements can play a significant role in kidney health. The full potential of many of these supplements still needs to be studied. Talk with your doctor before changing any aspect of your nutritional program. To find out more, you can check out Can Kidney Disease Be Cured.